Garrett Swank of Swanton with a putt Thursday during the Division II Boys Sectional Golf Tournament at Detwiler Park in Toledo. He qualified individually as he shot an 83 to tie for 10th place. 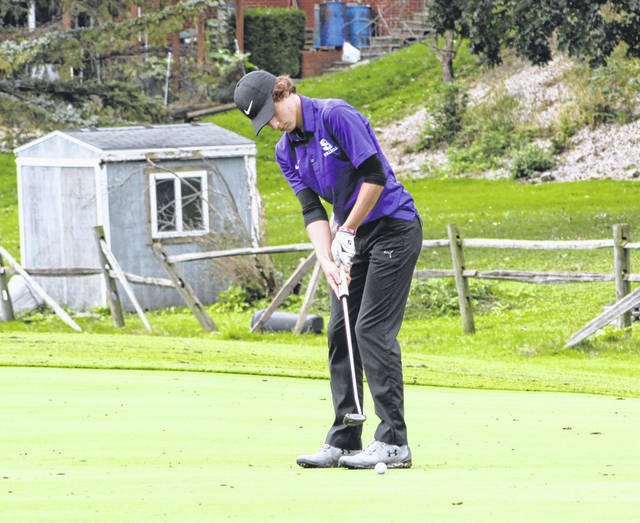 Carter Swank putts for Swanton Thursday at sectional golf. He shot an 87 for the tournament. 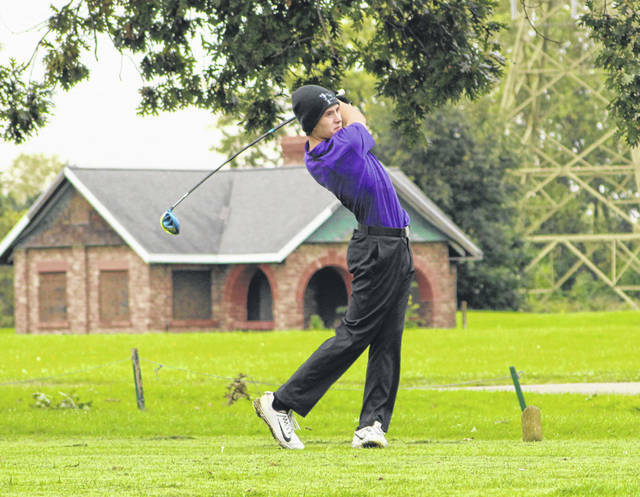 Austin Luce of Swanton watches his tee shot during Thursday’s sectional tournament. Luce had an 88 for the Bulldogs. 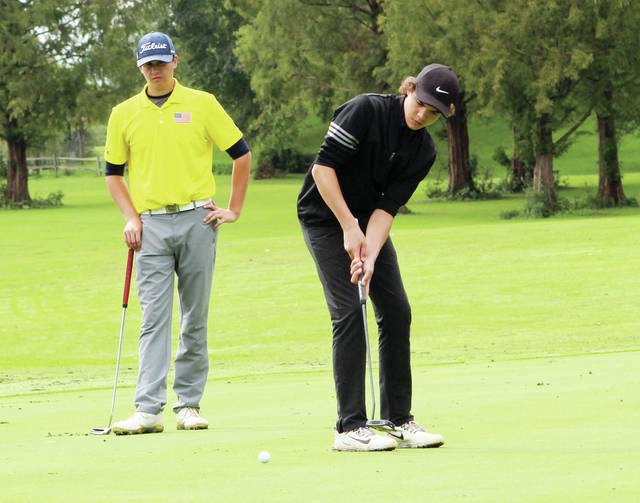 Sam Betz of Swanton, right, with a putt Thursday. He finished with a 90. 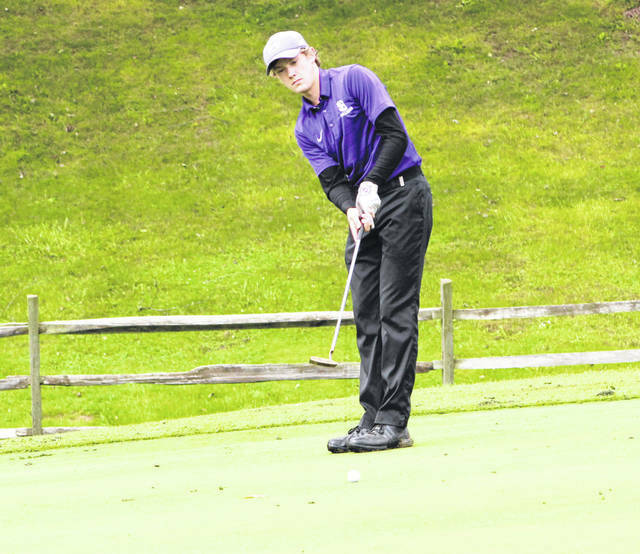 TOLEDO – Swanton did not come away empty handed Thursday at the Division II Boys Golf Sectional at Detwiler Park Golf Course in Toledo. That is because freshman Garrett Swank qualified individually for the district after tying for 10th with an 83. Archbold won the tournament – shooting a 324, Eastwood was second with a 338 team score, Genoa third at 339, Wauseon fourth at 346, Napoleon fifth at 347, and the Bulldogs were sixth with a 348. The top three teams qualify for the district tournament. Carter Swank (T-17th) added an 87 for Swanton, Austin Luce (T-19th) an 88, Sam Betz (T-23rd) 90 and Randy Slink (T-28th) 91. On Wednesday, Swanton hosted Maumee where they bested the Panthers 191-213. Luce led the way with a 44, Slink added a 46, Zach Schaller 48 and Brady Lemons 53.